I think I have some issues to work out. Normal people don't get up before dawn to drive well over 5 hours for a race that starts at noon with a temperature forecast of 98 degrees. That is exactly what Brooks Abel and I did this past Saturday for the Rocky Mount road race north of Shreveport. 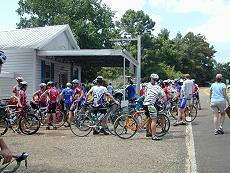 The Rocky Mount Cat 5 Omnium was two road races on Saturday and Sunday. Saturday's race was 43 miles over three laps on a relatively flat course with one significant hill at a hot spot sprint. On the first lap, the hot spot sprint is worth points in the Omnium finish. On the other laps, primes were up for grabs. I didn't have time to drive the course but did see the hot spot. We start the race a little after noon. I think there were around 35 racers in the field. Many of the same guys we have seen over the season and several new faces from Texas and maybe Arkansas. Brooks and I started out around the front and a couple times Brooks was able to drift off the front without much effort. We talked about possibly attacking together on the next hill to get off the front just to see what would happen. There weren't any hills for a while so Brooks decided to try to go off the front on his own. He got a gap and was away for while before a group of four or five brought the pack back to him. As soon as they caught Brooks, I attacked and broke away from the pack. I was going in the low 30s for a while and a group of three or four other riders bridged up to me. We started working but weren't able to stay away for very long. At 1km before the first hot spot we are all back together and me, Brooks, Matt Davis with LaSport, and James Bagley with Twin Cities, are in the front. At 200m I start my sprint up the hill. Matt jumps right away and we are going hard up the hill. He nips me on the line but omnium points go out to the top three. James gets third and Brooks is right behind him. The sprint took more out of me than it should have. I don't think this is going to be a great day. James breaks away through the feed zone while Matt, me and others are recovering from the sprint. We catch him about half way through the second lap. Brooks and me do our share of the work on the front but so do a lot of other riders. This is a pretty good Cat 5 field and the riders seem to have pretty good riding skills. During the third lap, my legs are starting to cramp. I had to pound down quite a bit of coffee to stay alert on the drive up and I think I am starting to feel it. 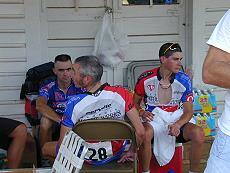 I drank a big cup of coffee between the TT and road race in Baton Rouge and cramped then as well. Live and learn. As we go up the hot spot hill and on the finish, James pushes the pace and I am working hard to stay towards the front. The pack was pretty much together until then with a few riders off the back. The finish is a gradual uphill and the yellow line rule was in effect for the whole race including the last 200m. We are four wide at about 500m. Brooks is right next to me and ready to lead me to the line but I am too tired and cramping to do anything. I tell Brooks he might want to try to break for the finish. He jumps and the field takes off. I stand to sprint and my right leg cramps hard. About 10-15 guys blowing by me like I am standing still (that's supposed to be my job). I finally dig and start sprinting again. I pass quite a few of them but can't get a clear line to the finish. I finish 10th and Brooks got 11th. We are both a little disappointed and I think we are starting to get spoiled by past results. With my bonus points for the hot spot sprint, I am tired for 7th overall. Sunday's race is 53 miles with a noon start. The temperature is hot again although there is a little more cloud cover. I pounded Gatorade down all morning before the race and avoided a lot of coffee in an effort to prevent the cramps again. The race begins with a 1 mile neutral start down a steep hill before we start the four loops. As we roll down, I know this will be a tough one to climb up on to the finish. I am sure there won't be a bunch sprint today. The race has about the same number of riders. At the first bigger hill a LaSport rider takes off but no one is interested in chasing this early. Brooks and I did a quick warm-up before the race and my legs are still tired from Saturday. I need to spin some before hitting it hard. The first hot spot on the course is again for bonus points in the omnium standing. I am much more interested in trying to get a good place in the race so am not that worried about the first sprint. The LaSport rider passes the hot spot off the front so only 2nd and 3rd place are at stake for the pack. I don't want anyone to get too far away from me after the sprint so I stayed up towards the front. James with TCC takes off real early and I don't even bother chasing him. I stay behind Matt and several of his LaSport teammates who are working well for him. We catch James with no problem well before the hot spot and at 200m I am second wheel behind Matt. I keep on his wheel and don't make much of an effort but still get third in the hot spot. We catch up with the rider off the front shortly after the feed zone on the second lap and pretty much stay together for the next lap. There are mostly rolling hills on the course with a one or two steeper climbs. I make it a point to keep the pace a little high on the steeper climbs to drop some of the pack which is gradually thinning. On the steep climb on lap three, James comes by me at the top and wants to break away from the group. There are only three of us together and I tell him I am not ready yet and he doesn't push hard for long. I figure we will be able to break the group up pretty easy and there is no need to go real hard for more than half a lap with only 3 or 4 riders. On the back part of the third lap, there are some breaks that are starting to stay away. I am in all of them but they get picked up by the group. One break had six good riders with both me and Brooks and I thought that one may have worked but we eventually got caught as well. Again this race has a lot of riders working at the front including both me and Brooks. On the third lap hot spot, a tiger racer sprints off the front and opens up a pretty nice gap. I figure we can worry about him after the feed zone. Volunteers provide neutral bottles in the feed zone and they are a life saver today. My HRM showed the temperature at 104 degrees although the weather station said it was only 97. There are a few miles and a couple of rollers between the feed zone and the big hill on the loop. That hill will be where the group breaks up and I want us all together at the start of it. I talk to a couple guys at the front and we pick up the pace and catch the tiger racer about a half of mile before the base of the hill. Brooks is a little bit back in the group and James with TCC is concerned that Brooks hasn't been working as much at the front. He said I was "making Brooks a cotton pillow" to rest up. There was quite a bit of friendly chatting at the front during the race which was nice. 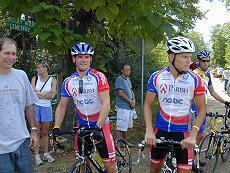 As the hill starts, I in the front with Matt, James and another TCC rider named Grant. I look back at the top of the hill and we have a gap on the field which is really spread thin. I tell the group we need to go hard now and we take off. We are about 10 miles from the finish. We start a paceline and don't stop until we get to the final hill about a mile from the finish. We really worked well together averaging right under 25 mph. Brooks is chasing people as they try to bridge up but we are gone at this point. We lap the women's racers before the hot spot. As we start the long hill in to the finish, we start climbing together across the road. I am feeling tired but no cramps. I look back down the road and there is no one but the women racers. James or Matt starts the sprint early and I don't have the gas to stay with them. The final 100 - 200m of the sprint is downhill after the long climb. Me and Grant are climbing together but I figured I better loose him before we start the downhill. I surge and drop him. Matt and James sprint hard to the finish and Matt nips James at the line. I finish a comfortable third in front of Grant. There were two riders who got off the front of the pack who finish next then Brooks comes in with a group of three or four for 9th place. I was able to move up to 4th place in the omnium standings and Brooks finish 10th. I am hard pressed for time and have a 5 1/2 hour drive in front of me. I load mike bike on the car and make the long drive home.